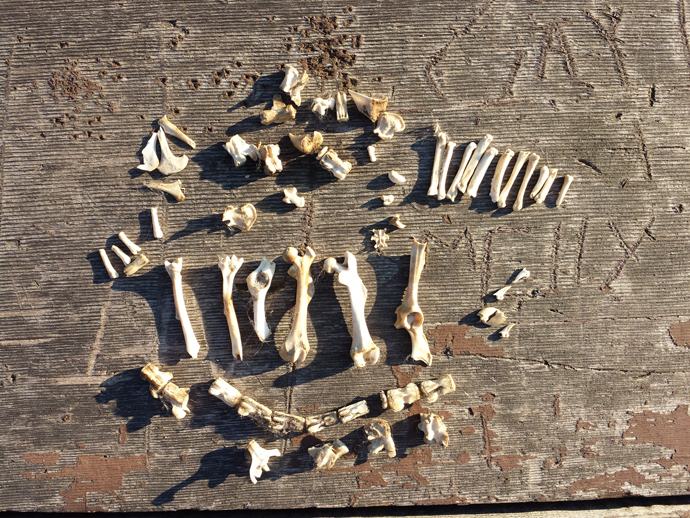 Just to prove that this blog is NOT about puppies all the time, I thought I’d share this owl pellet that I found yesterday. Ken and I were in the Okanogan Highlands (a work trip for him; a chance for me and the dogs to get out of the valley) and at the end of the day we were walking the dogs before the long drive home. I found this pellet at the end of a bench. Now that the busy summer season is past and hunting season too, the owl must have found it to be a quiet place to perch. 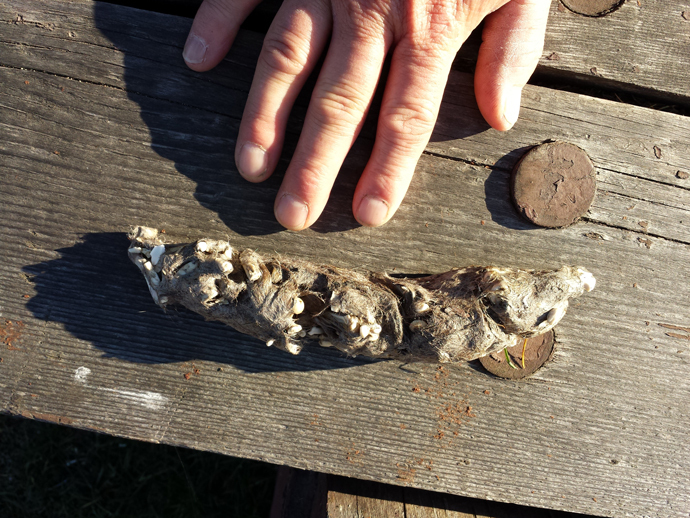 This is the largest pellet I’ve ever found – nearly six inches long. What is an owl pellet? Owls don’t have teeth and swallow their food whole. They do not digest the hair and bones. These parts are regurgitated as a pellet. We picked it apart to try to determine what the owl ate. We found gray hair and the bones of a small mammal. Ken speculated that it was the back half of perhaps a rabbit since there were no scapulas or a skull. You can see the vertebrae on the bottom of the image, thigh bones and hip sockets in the middle, tiny claws on the right with perhaps some long toe bones above them. Bear Creek Lumber has (had?) a barn owl living in a shed. My grandson patiently dissected a couple of pellets containing mouse bones.